Today, during the TCA press tour, HBO president Casey Bloys announced that the final season of Game Of Thrones will premiere “in the first half of 2019,” implying at the very least that we won’t have to wait until next July to see what happens to all of our favorite romantically involved relatives. Game Of Thrones has been a spring show for most of its run, save for season seven (which premiered in July), so this should be a nice gift to the people who like to ease into the new year with some ice dragons and face-swapping assassins. Meanwhile, just as Game Of Thrones is heading for the door, its spin-off series will be showing up for the party. As noted by Vulture, filming on the follow-up show from writer Jane Goldman—who created the whole thing without any help from useless slacker George R.R. Martin—is also set to begin in Belfast early next year. That show doesn’t have a director attached yet, and we still don’t know what it’ll be called, but it reportedly takes places ten thousand years before the start of Game Of Thrones. 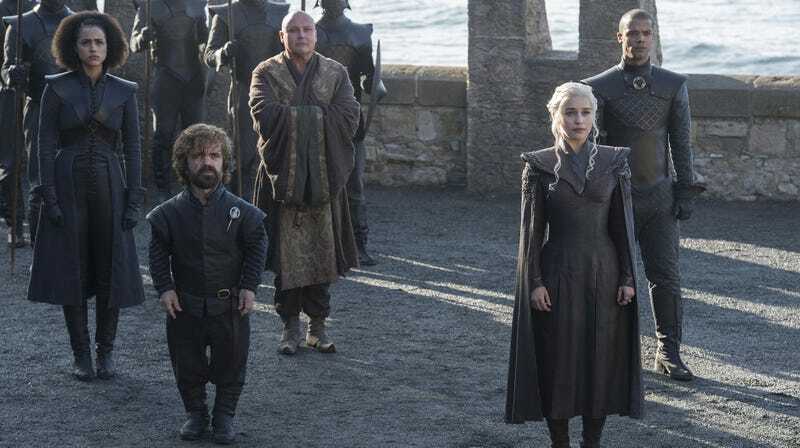 It also seems like the other Game Of Thrones spin-offs that were in the works have been shelved, but HBO could always dig them back up once Goldman’s show is done.